Adventure Lamp, from Ryan Davis, is a puzzle platformer starring an adventurer named Simon. Simon sets out to explore an ancient temple, but he gets separated from his equipment... all except his trusty headlamp. 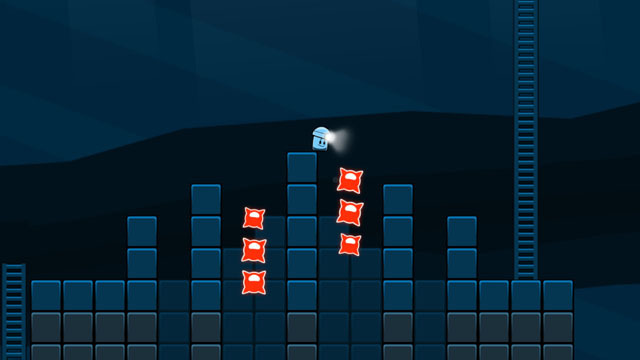 The player can toss this headlamp to activate switches and destroy enemies, but he must be careful when jumping as the helmet can fly off his head. Simon's adventure eventually takes him beyond the temple and into mushroom-filled caves, windy mountaintops, and into the fiery depths of an active volcano. Along the way, he must deal with ever more challenging switch puzzles that require him to engage hovering platforms, spring into the air on beams of light, contend with conveyor belts and reverse gravity beams, and make his way through dark corridors filled with enemy weaponry. The game is now available for PC and Mac via Steam and Itch.io, and is also planned for release on Wii U via the eShop. Check our coverage here.